I couldn’t feel more sick for them. A couple of weeks ago, news broke on websites like Guns.com that the Oregon legislature passed a nasty gun-confiscation bill. Funded by Bloomberg and pushed by Gabby Gifford’s gun-control organizations, the law enables gun confiscation by declaration rather than adjudication. What this does is enables family members, household residents and virtually anyone to petition a court to confiscate the firearms of someone they believe poses a risk to themselves or others. A real-life scenario would look something like this: a spurned “ex,” looking to gin up support for a child custody or divorce case, could say they simply believe their ex is a threat and the first time the “accused” would know about it was the knocking of law-enforcement at the door. No hearings. No witness testimony. No questions. No cross-examination. No representation by the accused. Now, I don’t have to sit here and tell you how fundamental to American jurisprudence the doctrine of “due process” is. “Innocent until proven guilty” is one of the pillars of American greatness, and the envy of nations and people all over the world. But unfortunately, this isn’t the first state to pass it. Washington state passed it by referendum in 2016 and California passed it before that in 2014. It’s on the move in other states as well, and in all cases is being pushed by national gun-control organizations and their state affiliates. It’s no secret in the gun rights community that Bloomberg and company have been targeting the upper Northwest for gun-control for the last several years. In fact, they’re following a very strategic map when it comes to choosing states for gun-control implementation. In the Midwest they’ve targeted Minnesota and Iowa. A little further east, Ohio and North Carolina top the list of states they’re targeting for implementing their agenda. But how were they successful in a state like Oregon? And more importantly, what can be done to prevent it from ever passing here? The answer is quite simple — activated, mobilized gun owners diligently on the alert to make sure the threat against our gun rights never succeeds. 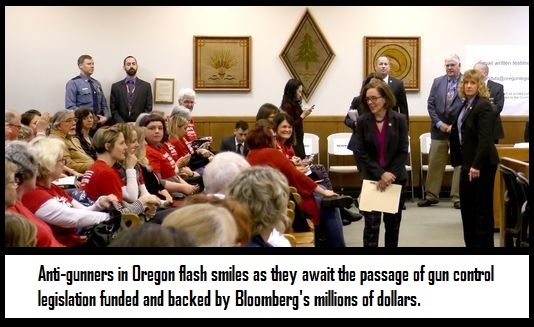 For several years, leaders in the Oregon gun rights community knew they were being targeted by Big Gun Control. And even though these leaders knew this, election season after election season went by where politicians were not forced to pay a price for sponsoring or supporting gun-control. In fact, some pro-gun “organizations” — who were supposed to FIGHT like dogs for their members — refused to raise resources to be effective during election season. These well-meaning but naïve “leaders” thought that the worthiness of their cause would win the day! So when election time rolled around, they lacked the resources and ability to hold politicians accountable even if they wanted to and were completely impotent. ▶ First, to stop gun control. We want to make sure that gun-control of any kind is defeated whenever and wherever it rears its ugly head. ▶ To restore gun rights lost. We want to make sure that politicians are passing pro-gun bills every single chance an opportunity presents itself. ▶ We exist to make sure that for every action or inaction taken during the legislative season that there is a swift and severe reaction during the election season. Because if the political careers of anti-gun politicians are not lying in the gutter after election season, they are only emboldened to push for more! So our job at Georgia Gun Owners is all three of these things on your behalf. But to do all three effectively takes time, money and talent. Writing emails and Facebook posts, writing mail letters and corresponding with members and supporters takes time. Mailing out postal mail to members, running radio ads during election season and exposing anti-gun politicians’ records to voters all take money. And creating a website, creating a database, managing the database (Microsoft Excel just isn’t up to the task) and making graphics — all these things take talent. And all three of these things must be done at a level sufficient and professional enough to accomplish the task! But unlike Bloomberg and his front-groups, we don’t have billionaires underwriting our efforts. Bloomberg issues press-releases every six months it seems announcing new, tens of millions of dollar infusions of cash into his gun control groups. But our side doesn’t have immense wealth, so we turn to you and ask you to entrust us with the resources needed. We don’t like doing it — but defending the Second Amendment demands it. Some people, even other Georgia-based gun rights organizations, attack Georgia Gun Owners for asking for your hard-earned contributions. But we feel no shame in doing so because your contributions don’t go to fund a glitzy convention or guest speaker fees . . .
. . . they go straight to forcing politicians to pay the price for everything they do during the election season and legislative season! We use your resources to fight for you. Period. Because the alternative is not an option to us: Oregon, Washington and California now have gun-control by declaration rather than adjudication, and their right to due process has been destroyed. In those states it is now easier for the legislature to pass “tweaking” language and expand the definition of those who are a “danger” to themselves or society. So when we send out alerts asking you to call or email your state representative, please do so. When we ask for contributions, we only ask for what you can afford, when you can afford it. So if an organization that gives no quarter to gun-control bills appeals to you,please join us. If an organization that strategically pushes for major, sweeping pro-gun reforms every chance the opportunity arises, please join us. And if you want to be a part of an organization that FIGHTS no holds barred at election time to make politicians pay a price for their behavior during the legislative season . . . If you’re already a dues-paying member and want to make an additional contribution, please click here. If you’ve not yet joined Georgia Gun Owners, please click here. Thank you for standing with us in this fight to defend our Second Amendment Rights.